Massachusetts Divorce | Farias Family Law, P.C. A divorce is a difficult experience to endure, especially when children are involved. Several issues need to be addressed between the parties, such as child custody, child support, property division, and alimony, among others. Divorce, although unfortunate for the family, marks the beginning of a new chapter in life. Make sure you start it in the best position possible. Divorces can go relatively smoothly if there are no disputes. However, there are usually some disagreements about how property, money, and child responsibilities should be divided. That’s why it’s important to get the assistance of a skilled, aggressive Massachusetts Divorce Lawyer. If there’s an unresolved issue, Attorney Bill Farias will fight for you in court. Also, this firm’s aggressive approach to litigation forces more favorable settlements. In your search for an attorney, make sure you find one that will go the extra step to protect your rights. Your attorney should also keep you informed and involved in your case. Quality representation is particularly important in divorce cases because it’s a time of vulnerability. The family turmoil that surrounds a divorce is psychologically traumatizing: anxiety is running high and very powerful emotions are at work. Being informed and updated regularly reduces the pain. When you’re deciding on a divorce lawyer, make sure you hire one that’s sensitive to your needs during such a difficult time. Massachusetts Divorce Lawyer Bill Farias will make sure that all of your questions are answered and that you are updated regularly in your case, which will make the process much easier for you. There is usually a lot at stake in a divorce, and the sooner you seek legal counsel, the better your chances of a favorable outcome. But make sure you do your homework before you decide on a lawyer. 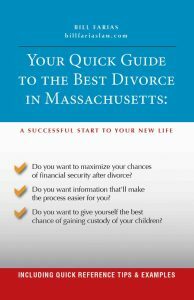 You should research Massachusetts divorce laws and take advantage of the wealth of information on the web: look around at different lawyers and different sites. Also, and most importantly, take advantage of free consultations because they give you an opportunity to meet with the attorneys personally, which is the best way to gauge their character and knowledge. You should also educate yourself on the divorce process in Massachusetts. Learning about divorce will ease your anxiety and will help you make educated decisions on your case. Q: I think I want a divorce. What should I do first? A: Back up. You should first reassess whether you want to proceed with a divorce immediately, or whether instead, you should explore alternatives to attempt to save the marriage. Before you decide on divorce, get advice from an experienced professional, such as a counselor (individual and/or couples). This is a life-altering decision and it’s beneficial to speak to someone who can help you objectively analyze your circumstances and help you make an informed decision. However, some relationships are beyond repair, and if that’s the case with yours, you must plan for the split. If it appears that all issues can be negotiated amicably between the parties, alternative dispute resolution should be explored. Essentially it’s geared toward helping the parties come to an agreement on significant issues. If you’ve tried alternatives and failed, or just don’t think they would work, you need to start preparing for divorce. Q: What should I do immediately to protect myself? A: Gather documents relating to the family’s salaries, tax returns, credit, debit, and bank statements, loans (mortgages, car loans), marriage and birth certificates, and immigration documents, etc. These documents will be necessary for the divorce process. Also, by having an attorney file a divorce complaint, you can freeze the marital assets to ensure that the other party doesn’t transfer, sell, or conceal property or money. And finally, document significant events as much as possible, including events that lead to the divorce, abuse, or financial misconduct. Q: Should I hire an attorney or should I represent myself? A: Hire an attorney. Although you can represent yourself, it’s a big risk. There’s too much at stake (property/money, children). Even if there are no disagreements between the parties at the beginning of a proceeding, issues often arise that require the knowledge and skill of a Massachusetts Divorce Lawyer. Find a lawyer that you trust. Take advantage of free consultations to meet them so that you can assess whether you feel comfortable with them. Also, make sure you hire a lawyer versed in trial practice: having an aggressive, skilled litigator will increase your chances of prevailing on key disputed issues, which are resolved with hearings and trials. It will also increase your chances of a favorable settlement. Q: What is the divorce process? A: Divorce is governed by G.L. c. 208 sec. 1-46, which are the Massachusetts divorce laws. It starts when your attorney sends a complaint about divorce along with a court summons to your spouse (defendant). The defendant then has 20 days to answer. Next, the case enters the pretrial period, which may last a few months. During pretrial, attorneys gather facts through interrogatories (written questions to the other party), depositions (asking the other party questions under oath), and requests for documents and other information. Also, any contested issues are resolved by motions filed by the attorneys, which can address discovery (getting information from the other side) or evidence (whether certain things will be admitted at trial). Pretrial is also the time for attorneys to negotiate. If the parties can agree on all significant issues, the case is resolved; if not, there’s a trial to resolve the disputed issues. A: The court will determine which parent gets legal and/or physical custody of the child(ren). The parent awarded legal custody makes the major decisions (e.g. medical, education). It’s common for the court to award joint legal custody unless there’s a major issue with one of the parents. The parent awarded physical custody will be living with the child. It is less common for the court to award joint physical custody because it tends to be more disruptive for the child(ren) (e.g. moving back and forth). The court will do what it thinks is in the “best interest” of the child, which is the applicable legal standard. “Best interest” is essentially a common sense assessment that takes into consideration a number of factors, including the child’s relationship with the parent, who was the primary caretaker, the optimal location for the child, and others. Click here to learn more about Massachusetts Child Custody Laws. Q: Will there be a child support order? A: Child support is determined by the financial circumstances of the parties. Generally, the non-custodial parent will pay an amount to the custodial parent for the child(ren)’s care and maintenance. The parents can agree on a child support amount. However, if there is a dispute, the court uses the Massachusetts Child Support Guidelines, which is a calculation that considers the parents’ incomes, finances, and other factors to determine the child support amount. Learn more about Massachusetts Child Support. Q: How are the property and money divided? A: Property division at one time was based on guilt and fault of the parties. That’s no longer the case. Property and money are now divided based on a practical assessment by the judge of the parties’ resources and needs. The legal term for this process is “equitable division.” The judge determines what property is part of the marital estate, and that property is then divided between the parties. This is perhaps the area of divorce in which a quality divorce lawyer can be of greatest assistance because the judge has considerable discretion in determining what should be included in the marital estate for the division. Skillful lawyering with creative arguments can put you in a much better financial situation going forward. Learn more about Massachusetts property division. Q: How is alimony determined? A: The longer the marriage and the lower the earning potential of one of the parties, the greater the chance that the earning spouse will have to provide support. Under Massachusetts Alimony Law, G.L. c. 208 sec. 34, the court considers a number of factors, such as the length of the marriage, the occupations, and health of the parties, whether one party tended to the home, and others to determine alimony. Also, alimony can be awarded temporarily or permanently depending on the circumstances. Learn more about Massachusetts Alimony Law. It’s important to speak to an attorney as soon as possible to ensure that you’re taking the right steps to protect yourself. Also, you need a skilled litigator to get you what you’re entitled to. Contact Massachusetts Divorce Lawyer Bill Farias for a CONSULTATION at (508) 675-0464 or submit the contact form on this page.